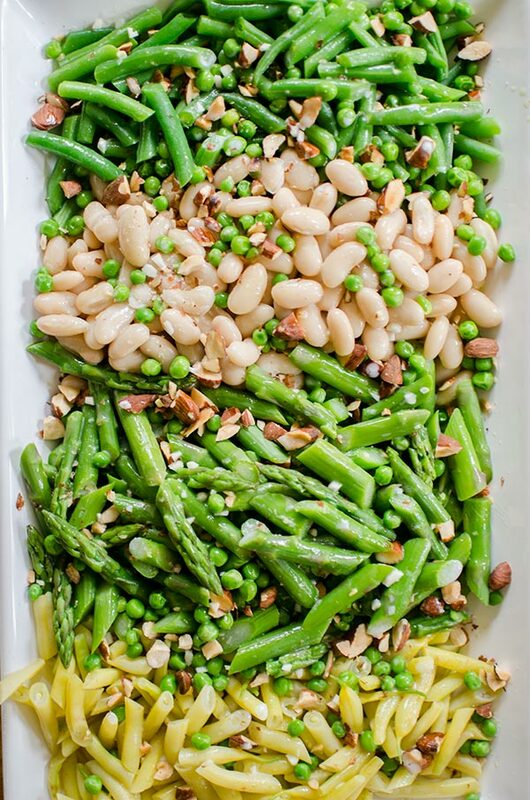 A delightful spring salad packed with green beans, wax beans, asparagus and peas made with a coconut dressing is the ultimate vegan salad that works as a side dish or light lunch. Well if this isn’t one of the most beautiful spring salads you’ve ever seen then I’m not sure we can be friends anymore. I mean look at all of that beautiful spring produce; there are green beans and wax beans, asparagus and peas. Hello healthy spring eats! I’ve never met Allison, but she’s a fellow Canadian blogger and I’ve been a fan of her blog for quite a few years (we used to comment back and forth back when her blog was known as CleanWellness). When she announced her cookbook was coming out, I knew I would be getting myself a copy. 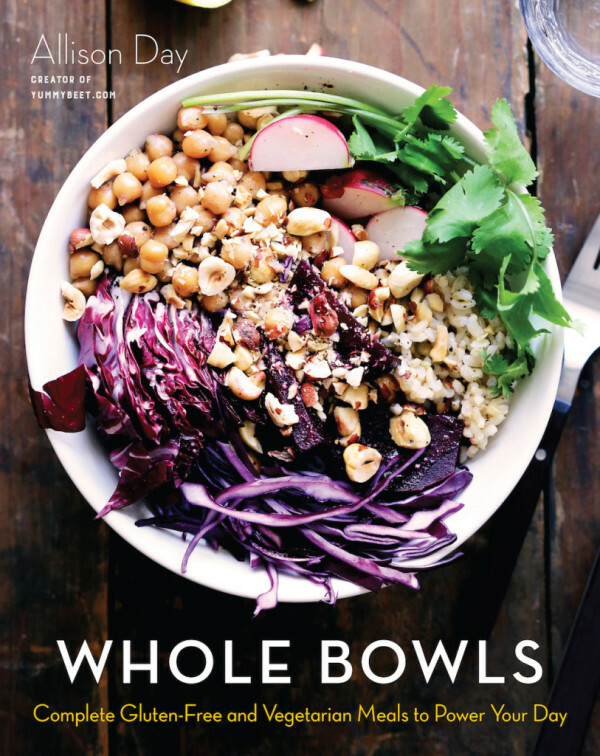 I’m always inspired by the healthy recipes she shares and love the philosophy behind Whole Bowls. She’s also a nutritionist, so I love knowing that these recipes while being absolutely delicious also have her stamp of approval. The entire concept of the book is based on The Whole Bowls Formula which is a simple and versatile formula which basically helps you figure out how to create your own bowl. What are the elements of the formula? Condiments + crunch or garnish + cheese (optional) + grains + non-starchy vegetables + starchy vegetables or fruit + protein. Easy enough! And she even includes amounts and measurements for the formula, which I love. The whole idea is that you can easily customize a bowl into whatever you’re craving. I made a couple of switches to this recipe, opting to use white kidney beans instead of butter beans and almonds instead of hazelnuts, but that just goes to show you the beauty of Whole Bowls – the recipes can easily be adapted to whatever you have on hand. The book starts out with a vegetarian pantry guide which is very helpful for those of us (ahem, me) who are trying to eat more vegetarian meals. There is also a helpful how to cook from this book section which gives preparation tips (and make ahead tips) so that you have everything ready to go before you get started. Filled with beautiful pictures and tons of healthy recipes for everything from Sweet Potato Breakfast with Gingerbread Pecan Crisp (which I’ll be making at Christmas this year) to this healthy three-bean garden salad with asparagus and coconut dressing. Now, why I deiced to shoot this three bean salad on a plate and not a bowl, I can’t tell you. Sometimes the brain just doesn’t work. 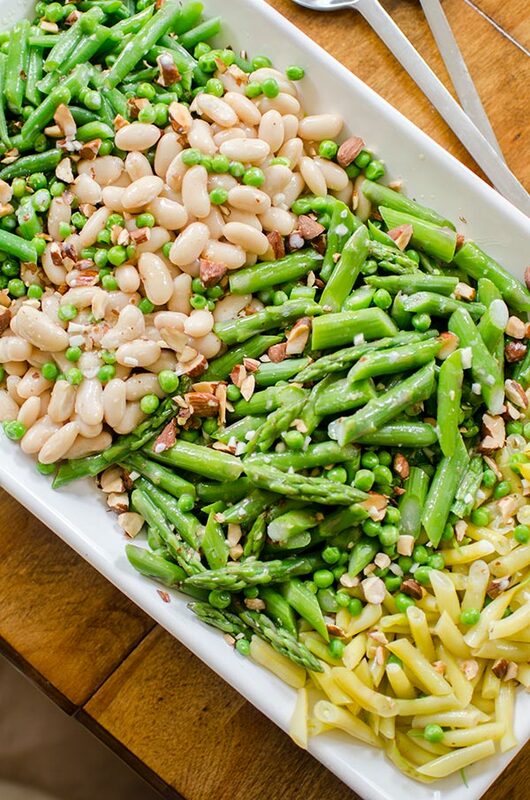 This salad is fresh and light but packed with protein from beans and nuts. The green beans, wax beans and asparagus all cook in under 5 minutes and the dressing, which is a mixture of coconut milk, lime juice, garlic and olive oil gets whisked together in minutes. 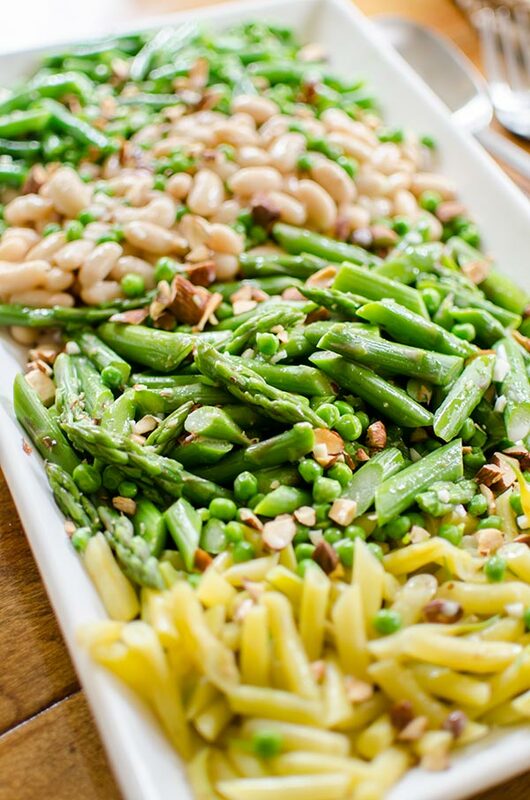 The perfect spring salad, this dish also makes a great light lunch. Steam green and wax beans until tender-crisp, about 3-5 minutes. Immediately run cold tap water over beans to preserve colour and cool down. Steam asparagus according to bean directions. Dry as much water off steamed beans and asparagus as possible with a clean dish or paper towel. In a large salad bowl, toss all salad ingredients with desired amount of dressing (you may have extra) serve. Let me know if you pick up a copy of Whole Bowls and if you give this three-bean garden salad with asparagus and coconut dressing a try. Disclosure: I was provided with a copy of Whole Bowls from the publisher for review purposes. I am not being compensated for writing this post. As always, all opinions are 100% my own. Can't wait to try this recipe. This blog book tour has been such fun!